A juniper berry is the female seed cone produced by the various species of junipers. It is not a true berry but a cone with unusually fleshy and merged scales, which give it a berry-like appearance. The cones from a handful of species, especially Juniperus communis, are used as a spice, particularly in European cuisine, and also give gin its distinctive flavour. 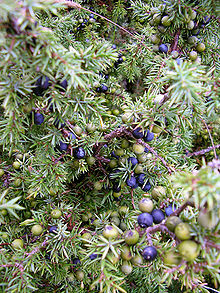 Juniper berries may be the only spice derived from conifers. All juniper species grow berries, but some are considered too bitter to eat. In addition to J. communis, other edible species include Juniperus drupacea, Juniperus phoenicea, Juniperus deppeana, and Juniperus californica. But the berries of some species, such as Juniperus sabina, are toxic and consumption of them is inadvisable. The flavor profile of young, green berries is dominated by pinene; as they mature this piney, resinous backdrop is joined by what Harold McGee describes as “green-fresh” and citrus notes. The outer scales of the berries are relatively flavourless, so the berries are almost always at least lightly crushed before being used as a spice. They are used both fresh and dried, but their flavour and odour are at their strongest immediately after harvest and decline during drying and storage. Juniper berries are used in northern European and particularly Scandinavian cuisine to “impart a sharp, clear flavor” to meat dishes, especially wild birds (including thrush, blackbird, and woodcock) and game meats (including boar and venison). They also season pork, cabbage, and sauerkraut dishes. Traditional recipes for choucroute garnie, an Alsatian dish of sauerkraut and meats, universally include juniper berries. Besides Norwegian and Swedish dishes, juniper berries are also sometimes used in German, Austrian, Czech, Polish and Hungarian cuisine, often with roasts (such as German sauerbraten). 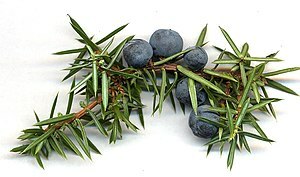 Northern Italian cuisine, especially that of the South Tyrol, also incorporates juniper berries. Juniper, typically Juniperus communis, is used to flavor gin, a liquor developed in the 17th century in the Netherlands. The name gin itself is derived from either the French genièvre or the Dutch jenever, which both mean “juniper”. Other juniper-flavoured beverages include the Finnish rye-and-juniper beer known as sahti, which is flavored with both juniper berries and branches. Another drink made from the berries is a Julmust, a soft drink made in Sweden mainly sold during Christmas. The brand Dry Soda produces a juniper-berry soda as part of its lineup. Recently, some American distilleries have begun using ‘New World’ varieties of juniper such as Juniperus occidentalis. A few North American juniper species produce a seed cone with a sweeter, less resinous flavor than those typically used as a spice. For example, one field guide describes the flesh of the berries of Juniperus californica as “dry, mealy, and fibrous but sweet and without resin cells”. Such species have been used not just as a seasoning but as a nutritive food by some Native Americans. In addition to medical and culinary purposes, Native Americans have also used the seeds inside juniper berries as beads for jewellery and decoration. An essential oil extracted from juniper berries is used in aromatherapy and perfumery. While classified as generally recognized as safe in the United States, juniper berries may have various side effects that have not been tested extensively in clinical trials. Mainly due to an increased risk of miscarriage, even in small doses, consuming juniper berries may affect pregnant or breastfeeding women and people with diabetes, bleeding disorders or after surgery. In traditional medicine, juniper berries were used for female birth control. In an in vitro study, juniper essential oil was studied for its possible antimicrobial and antifungal properties. Juniper berries, including Juniperus phoenicea and Juniperus oxycedrus have been found in ancient Egyptian tombs at multiple sites. J. oxycedrus is not known to grow in Egypt, and neither is Juniperus excelsa, which was found along with J. oxycedrus in the tomb of Tutankhamun. The berries imported into Egypt may have come from Greece; the Greeks record using juniper berries as a medicine long before mentioning their use in food. The Greeks used the berries in many of their Olympics events because of their belief that the berries increased physical stamina in athletes. The Romans used juniper berries as a cheap domestically produced substitute for the expensive black pepper and long pepper imported from India. It was also used as an adulterant, as reported in Pliny the Elder‘s Natural History: “Pepper is adulterated with juniper berries, which have the property, to a marvellous degree, of assuming the pungency of pepper.” Pliny also incorrectly asserted that black pepper grew on trees that were “very similar in appearance to our junipers”. ^ a b c d Ciesla, William M (1998). Non-wood forest products from conifers. Food and Agriculture Organization of the United Nations. ISBN 978-92-5-104212-0. Chapter 8: Seeds, Fruits, and Cones. Retrieved July 27, 2006. ^ Steingarten, Jeffrey (1997). “True Choucroute”. The Man Who Ate Everything. Vintage Books. p. 244. ISBN 978-0-375-70202-0. The chapter is an essay first published in 1989. ^ Jackson, Michael (1995). Sweating up a suitable thirst. Michael Jackson’s Beer Hunter. Retrieved 30 July 2006. ^ Bend Distillery. Cascade Mountain Gin Archived 2011-07-07 at the Wayback Machine. Bend Distillery. Retrieved 10 Dec 2010. ^ “Title 21, Chapter I, Subchapter B, Part 182, Electronic Code of Federal Regulations – Substances Generally Recognized as Safe (GRAS); section §182.20 Essential oils, oleoresins (solvent-free), and natural extractives (including distillates)”. U.S. Government Publishing Office. 3 May 2017. Retrieved 5 May 2017. ^ Barnes, Joanne; Anderson, Linda A.; Phillipson, J. David (2007). Herbal Medicines (3rd ed.). Pharmaceutical Press. p. 386. ISBN 978-0-85369-623-0. There is a lack of clinical research assessing the efficacy and safety of juniper. There is evidence that the berries are abortifacient and since this is believed not to be due to the oil there must be other toxic constituents present. In view of this, use of juniper should not exceed levels specified in food legislation. Juniper is contra-indicated during pregnancy and should not be used during lactation. […] There is a lack of clinical safety and toxicity data for juniper and further investigation of these aspects is required. ^ a b “Juniper: Uses, Side Effects, Interactions and Warnings”. WebMD.com. Retrieved 24 December 2016. ^ Pepeljnjak, Stephen (October 4, 2005). “Antimicrobial activity of juniper berry essential oil” (PDF). Acta Pharmaceutica – de Gruyter. 55: 417–22. ^ From Bostock and Riley’s 1855 translation. Text online.